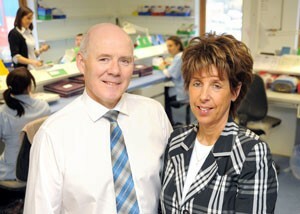 Charlie Gallagher founded Dental Technique Laboratory back in 1989 and the business is now in its 30th year. 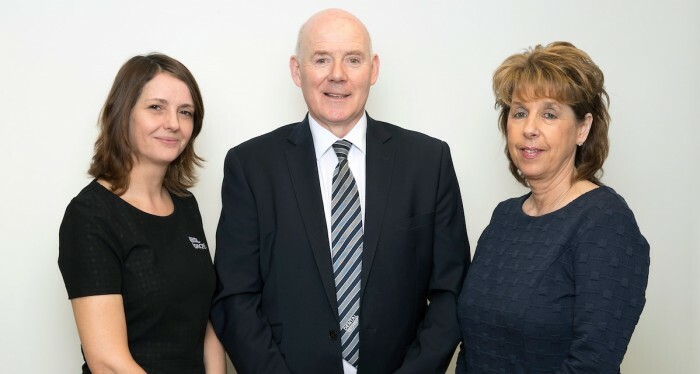 To stay in business for thirty years is a considerable achievement in this day and age, and for one Perthshire company that landmark birthday is just around the corner. 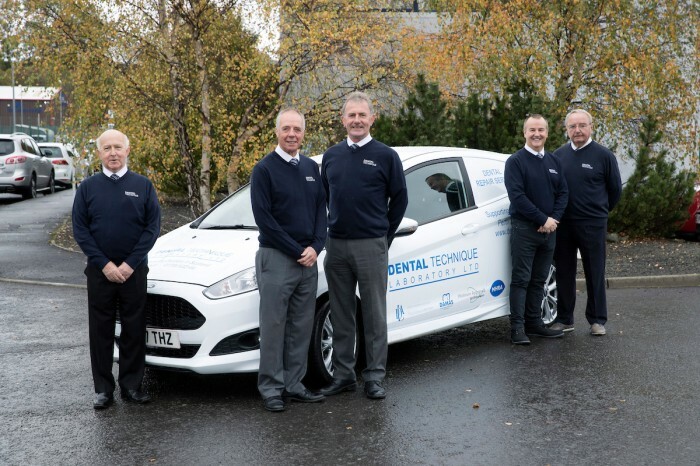 Dental Technique Laboratory has been keeping the people of Perth and beyond smiling for three decades since local businessman and trained dental technician Charlie Gallagher founded his company back in 1989. Since arriving in Perth as an eleven-year-old boy from a small village across the water in Ireland, Charlie has made the Fair City his home and is undeniably passionate about his local area. He has resided here ever since and the former St. Columbus pupil runs his business with his wife, Jane, and raised his two boys Ross and Matt in a city he is proud to call home. Based in their state-of-the-art laboratory out at Perth’s Inveralmond Industrial Estate, Charlie and Jane have built the company up to be recognised as one of the country’s most established and respected dental firms. Not bad when you consider how it was he stumbled upon his profession - a chance meeting at the side of a badminton court. The man in the suit was a local dentist who pressed a fresh-faced teenager coming to the end of his school years on what his future plans were. Charlie was all set to work for a local sports shop when his time at St. Columbus School was over, but the dentist had other ideas for him. “I was going to be working at Joe Anderson’s sports shop while doing sports and retail management degree in Dundee. It seemed like the perfect pathway for me given my passion for sport, but the dentist told me I was making a bad decision as there was no clear progression path for me by going to work for somebody else’s family business. “He told me that he knew my family and that his company were currently recruiting trainee dental technicians, and that I should apply. I spoke with my headmaster about it the following Monday and on the Tuesday, I was in getting some work experience. “I fell in love with it straight away. There were so many machines, none of which I had any idea how to work, but they fascinated me and I was keen to learn. And that was that – one chance meeting on a badminton court and forty-five years later I’m still in the industry and I still love it!” And that was that – one chance meeting on a badminton court and forty-five years later I’m still in the industry and I still love it! Although the badminton court may seem like a random place for Charlie to embark on a successful dental career, it was there that he was perhaps best-known in his early days. A Scottish internationalist, Charlie represented his country in the sport at the 1982 Commonwealth Games down in Brisbane, Australia and won national titles in singles and doubles over the years. He also played in the prestigious German Badminton Bundesliga for a number of years, where he was supported by the firm that gave him his first steps in the dental industry. “Leishman and Partners were absolutely fantastic with me. They gave me the chance to learn my trade with them and put me through all of my qualifications too. Normally, apprentices would move on once they’d served their time but I was lucky and the firm kept me on once I was qualified. “The directors had a passion for sport, so they were happy to help me in any way they could when it came to my badminton career. They gave me time off to compete in tournaments and it’s something I have always been grateful to them for. I competed over in Germany in the Bundesliga for a few years, and that was every second week so we had to come to an agreement to allow me to keep my job whilst being able to test myself in one of Europe’s top badminton leagues. Charlie quickly rose through the ranks and was appointed as one of the firm’s managers from a young age. He soon met his wife, Jane, and that was the start of a slight shift in Charlie’s career path. Still besotted with his job, he was also intrigued by the business side of things and decided that the next logical step was to go out on his own. He headed to the office of his partners and told them that he wanted to buy them out. Although the initial reaction may not have been what Charlie had hoped for, it wasn’t long before they took him seriously and a deal was agreed. “I think they thought it was a bit of a laugh at first,” he joked, “they probably thought I was in some kind of dreamland. I’d met Jane, we got married and we’d started to talk about it and agreed that it was the best way to go. That gave me the drive to go to the partners with an offer. The partners stuck around for Charlie’s first year to help him get settled into the business side of things before leaving both he and Jane to it. The company had two bases in Perth – one in Letham and one in the town – as well as a practice in Crieff too. That gave Charlie a strong footing to set about growing the business and building its reputation as one of the best in the country. Not one to forget about those who have helped him, Charlie admits that he’s had some fantastic mentors over the years. One mentor in particular was instrumental in helping Charlie to grow the business to such an extent that they needed to move to purpose-built premises to satisfy the demand from new and existing clients. “When you’re starting out it’s always good to have some help and support and I have been lucky enough to have had some fantastic mentors over the years. When you’re starting out it’s always good to have some help and support and I have been lucky enough to have had some fantastic mentors over the years. One man in particular who helped me to get to where we are today was Raymond Miquel. He was an experienced businessman and he sat down with me after a few years and told me that the only logical way we could grow the business was to acquire other companies and their client bases. “So, that’s what we did and that business model has worked for us. We’ve taken over seven companies now and we always try to keep their staff members on where possible and we’ve been lucky enough to employ some excellent members of staff on the back of that. As the business grew and grew, we realised we needed to find new premises as the logistics of running between different labs in the town was just not working. Now one of the Fair City’s most established businessmen, Charlie has served his community with distinction. He has been involved heavily with local organisations and Dental Technique Laboratory sponsor a number of local sports clubs and events. “I’ve always been a big believer in giving back to the community and given my background in sport I always try to do whatever I can for those involved in sport at a local level. One of my staff members who has been with the company for years, Bruce, is one of the longest-serving secretaries in Scottish football at St. Johns. Charlie is also heavily involved in golf in Perthshire and has recently just stepped down from his seat as the county’s golf president after two years in the role. He also sponsors the county’s junior teams in the hope that Perthshire can remain one of the main forces in Scottish golf, and that the area can produce another Bradley Neil in the coming years. Perhaps one of his biggest sporting roles in Perth though was when one of city’s most famous businessmen turned up at his door and asked him to do him a huge favour by joining the board of St. Johnstone Football Club. And Charlie admits that he couldn’t say no to a man who he has so much respect for and who he considers a friend. “Geoff Brown has always been fantastic with me and he’s given me advice and guidance throughout my years in business. I can just remember one day he turned up at the house and said he needed to ask me a huge favour. “He wanted me to join the board of directors at St. Johnstone to help out for a while as he needed to take a step back for a short period. It wasn’t something I’d ever really wanted to do but as someone who went to the games and was passionate about the club, I couldn’t say no. I stayed on the board for a lot longer than was originally planned but it was an honour to be involved with the club and to be able to help out a friend in Geoff Brown.” I’ve always tried to do what I can for the people of Perth and to be recognised for my contributions to business, sport and charity is such an incredible feeling. As well as being a part of many sporting organisations in Perthshire, Charlie also uses his business influence to add value to many other committees and groups such as the Rotary Club and the High Constables. Active involvement in his local community has led to Charlie being awarded the prestigious title of Deputy Lord Lieutenant, something which was confirmed in the past few days much to Charlie and his family's delight. “It’s a phenomenal honour! I’ve been lucky enough to be involved in some fantastic roles within the local community and have been given honours within the Rotary and the High Constables as well which is extremely flattering. Looking back on his career so far, it’s hard not to be impressed by Charlie’s endless list of achievements. From Commonwealth athlete to successful businessman, with community organisation involvement and a seat on the board of directors at St. Johnstone F.C., it’s certainly not your ordinary CV. 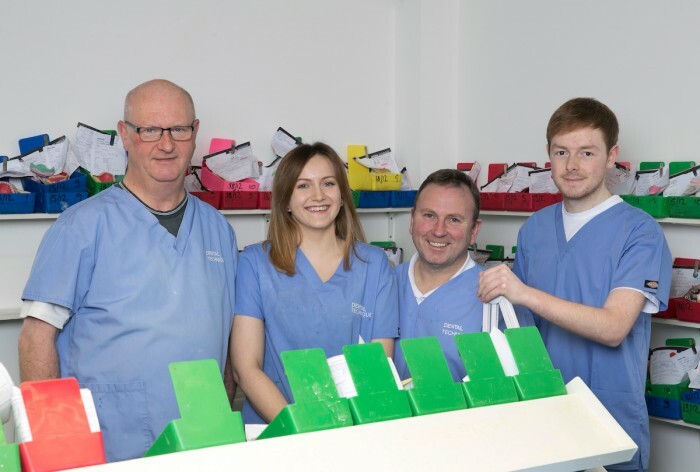 Charlie has also worked on the Scottish Government’s dental committee in the past which goes to show just how highly regarded he is as a dental technician. With their 30th anniversary looming, and Charlie having recently celebrated his 60th birthday, you’d be forgiven for thinking that he may be looking to slow down. However, that is most definitely not the case, and it looks like being another busy year for Charlie and Dental Technique Laboratory. “We’re constantly try to keep up to speed with the modern technologies and we’re constantly adapting to make sure we’re up there with the best. There’s absolutely no complacency here and we’re always striving for better! “We’re investing money in our future and in our staff and we’re still having fun every single day. I still love what I do. There’s not a better feeling for me than seeing somebody who’s maybe had a bad accident and dental-wise they are cosmetically in a bad way. We work with them and the surgeon to get them smiling again and it’s one of the most rewarding parts of the job. To find out more about Dental Technique Laboratory or to enquire about the services they offer, visit the website or head over to the company's Facebook page. The pictures for this article were taken by Graeme Hart of Perthshire Picture Agency. You can view his website here.